Do you often judge yourself harshly? Self-criticism and self-judgment are the most common underlying issues we see in our San Francisco therapy practice. Under the outward struggles people are dealing with – work stress, relationship problems, depression, or addictive behavior – there is very often a deep sense of feeling flawed. This sense of feeling flawed, or not okay, is painful. And when you feel flawed on a fundamental level, or you feel that at your core you are not okay, you will likely be very self-critical. You’ll criticize yourself not only for your actions, like snapping at your partner or making a mistake at a work project, but for your emotions as well. And then, you’ll feel bad about feeling bad, criticizing yourself when you feel angry or fearful or any other emotion you think you shouldn’t have. When you judge your emotions, it’s almost as if you subject yourself to a sort of made-up law forbidding you to feel certain emotions. You tell yourself that you’re bad or wrong for feeling the way you do. By the time the negative circle comes around, self-blame and shame have you emotionally bound in believing even more fully that you’re inadequate or less-than. If you’re like most people, you want to be the best version of yourself – and you will fall short of this ideal. Everyone does. This is a part of being human. But when you do fall short of this ideal, can you be compassionate with yourself? When you are the worst version of yourself, can you still be kind to yourself? Where did you learn to be so mean to yourself? Perhaps you’ve wondered where the root of your self-criticism lies? After all, being harsh with yourself seems to come so naturally. Maybe you’ve come to the point of half-heartedly accepting the inner harshness and even mistaking it for motivation to change. The only problem is that we humans don’t work that way. Self-criticism rarely leads to lasting change. Criticizing yourself for being a lazy bum may get you to the gym for a day or two, but it won’t help you make sustained health or fitness changes. We are much more apt to change with encouragement, support and loving accountability. Unfortunately, many cultural streams feed into this ocean of misperception. So much in our culture tells us that if we just tweak a few things here and there, we’ll be okay. To put it bluntly, there is a self-improvement monster lurking in today’s modern world. This leviathan gives you the sense that you are a project to be worked on. Many people live under its thumb, trudging through life with a deep sense of not being okay or not feeling good enough. An internal battle rages between wanting desperately to change and being unable to accept yourself because you haven’t changed enough. Remember that to judge yourself is hurting yourself. And hurting yourself isn’t natural in the least bit. Humankind likes to compete. Often, this innate drive is taken a step or two (or a thousand) too far. Here’s the thing, cultural comparisons are extremely imbalanced because they compare your insides to others’ outsides. Critical parents, parents who withheld praise, or parents who didn’t feel good about themselves, of course, could not teach you to feel good about yourself. Depending on your family message, you may be conditioned to feel or think a certain way. For instance, maybe the messages of “not getting too big for your britches” resounded within your family. Or you were taught not to stand out or that it’s shameful to think well of yourself. A common notion is that “pride cometh before the fall.” Theologians would argue that this particular passage is taken out of context most of the time, but this admonition against pride may have a deep-rooted meaning for you because of your religious background. In essence, family and cultural messages like these teach you to equate feeling okay about yourself with feeling boastful or better-than. This eliminates the middle ground so that either you feel like you are bad or feel like you are better-than (which in turn, makes you a bad person). Feeling a sense of steady, grounded “okay-ness” is very different than a puffed up, inflated sense of self. And usually, those who feel better-than, or think they are better than others, also feel bad about themselves underneath. That sense of superiority is brittle and can cover up shame and feelings of deficiency. So you see, while there are likely many seemingly innocent influences that lead you down the road to being your own harshest critic, there’s no doubt that self-criticism is hurting you. 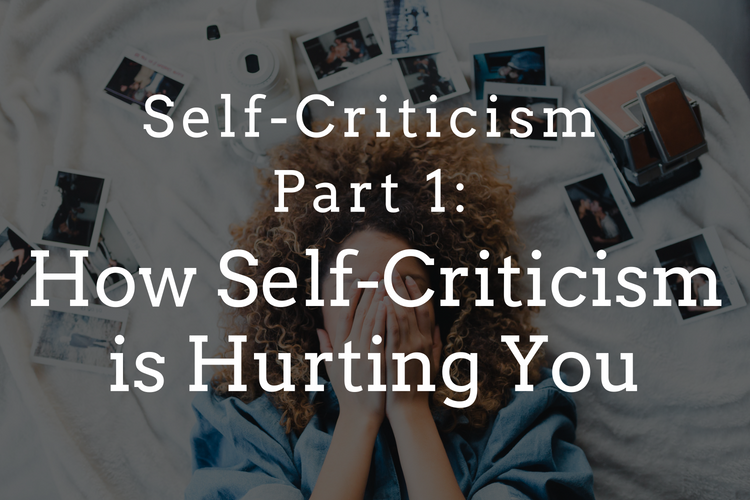 Check back next week for part 2 in this Self-Criticism series to see how you can find your way out of the self-criticism minefield, so you can start to feel whole and worthy again. Need help to stop hurting yourself with self-criticism? Call us at (415) 310-5142 to book your San Francisco therapy appointment today.